Ready for some waffles that not only taste incredible but are actually good for you, too? 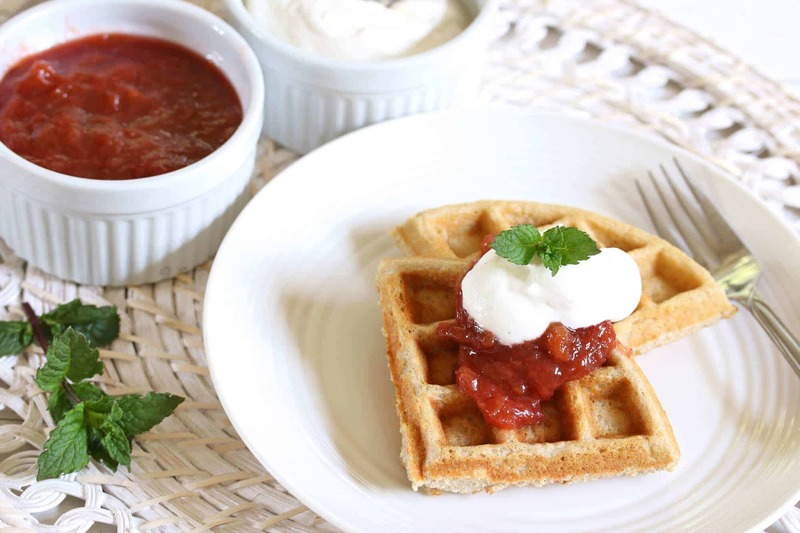 These are some of our favorite go-to waffles served with a variety of syrups, and paired with this Rhubarb Compote and Vanilla Cream they are simply amazing! 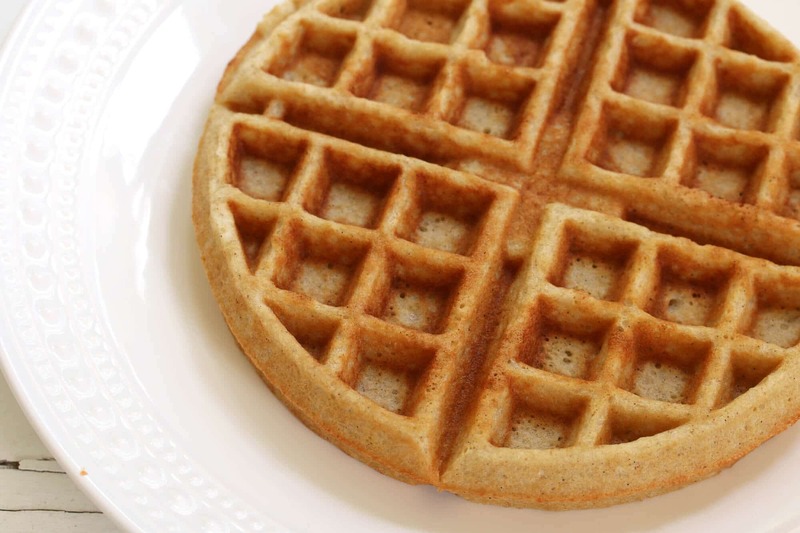 Made with oat and buckwheat flour, these waffles have a great flavor, texture and are highly nutritious! Oats have such a terrific flavor, it’s no wonder they’re a breakfast staple. 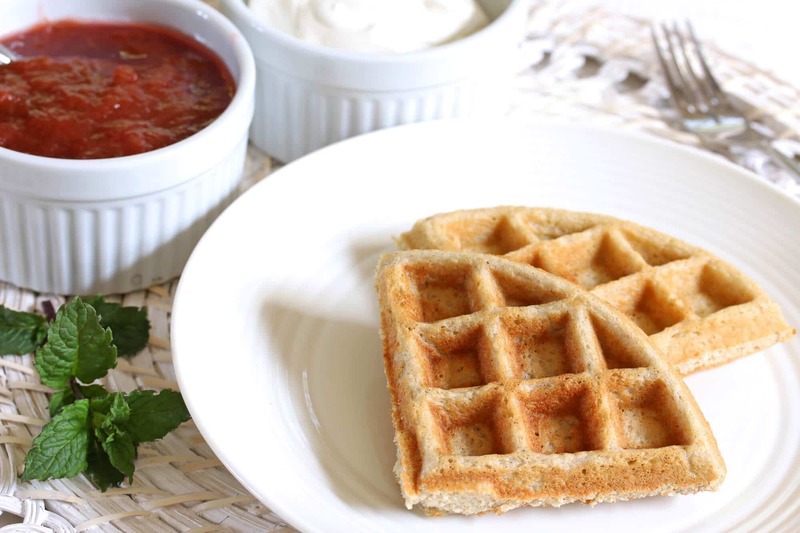 You’ll love the subtle oatmeal-like flavor of these waffles. Oats have a specific type of fiber known as beta-glucan. This fiber has been extensively studied since the early 60’s and it’s been shown to lower bad cholesterol levels. Beta glucan also increases the production of appetite-control hormones (oats leave you feeling more satisfied) and boosts immune system function. Studies have also shown promising results that oats can help improve insulin sensitivity and help control blood pressure. Oats also have a antioxidant compounds called avenanthramides that is found almost exclusively in oats. These antioxidants have been shown to help prevent free radicals from damaging LDL cholesterol, thus reducing the risk of heart disease. 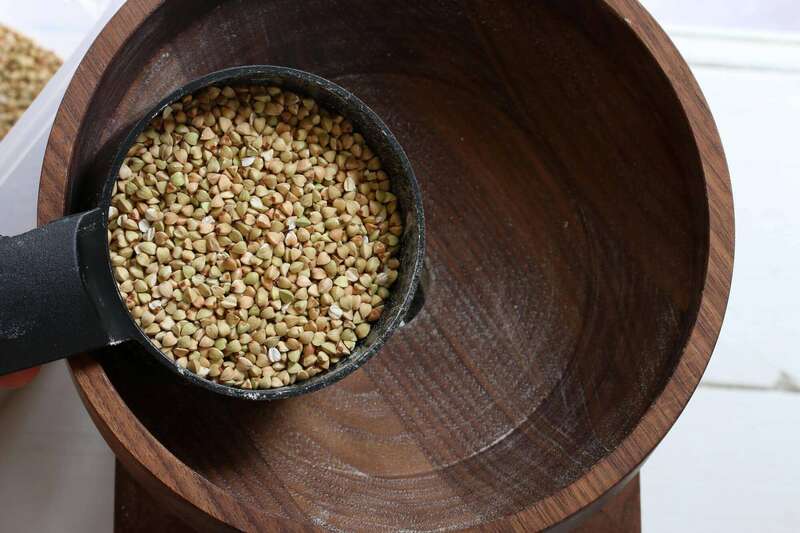 Most people think of buckwheat as a type of grain cereal but it isn’t a grain at all. It’s actually a fruit seed and is in the same family as rhubarb and sorrel (so it’s perfect that we’re pairing it with a rhubarb compote). It has a wonderfully sweet, nut-like flavor. Buckwheat is high in fiber which comes with a whole host of health benefits. Among other things, studies have shown that the fiber in buckwheat helps slow down the rate of glucose absorption after a meal and scores high in its ability to leave you feeling satiated. It also helps in cholesterol, blood sugar and blood pressure control and can help prevent gallstones. Buckwheat has rich supply of flavanoids, particularly rutin which acts as an antioxidant in fighting disease by extending action of vitamin C. Buckwheat is also a great source of several essential vitamins like manganese, magnesium and copper. So what better way to start your morning or to enjoy an afternoon snack than to sit down to these Oat and Buckwheat Waffles? Instead of drenching it with the usual high-sugar syrup, we’ve got a delicious rhubarb compote that’s topped with vanilla-infused whipped cream. It’s a lighter, healthier, but thoroughly delicious breakfast option. But they’re not just for breakfast – enjoy them as a dessert snack any time of day! And if you happen to eat gluten-free, these waffles are naturally GF. And you’d never guess it! These waffles call for oat and buckwheat flour. You can find oat and buckwheat flour in any health food store and in some well-stocked grocery stores. You can also conveniently purchase them online HERE and HERE. If you have a grain mill though, I highly recommend grinding your own flour for optimal nutrition and flavor. 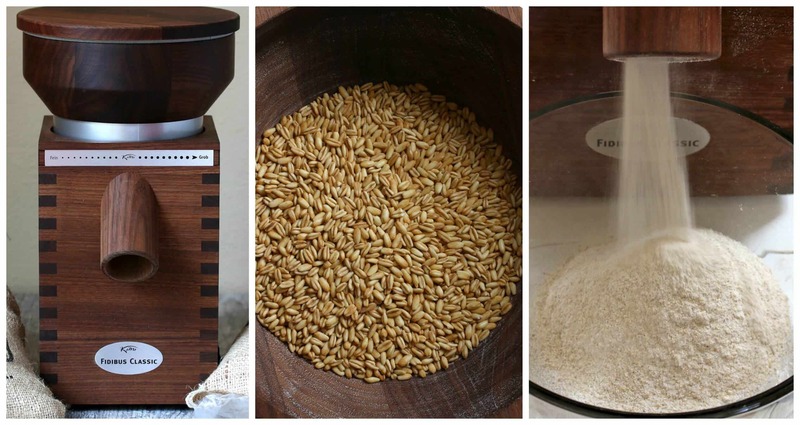 I ground my grains fresh in my gorgeous German KoMo Classic Grain Mill. With a 12-year warranty, the quality and construction is amazing. I don’t even buy flour anymore, I purchase my grains in bulk and grind my own. I use it nearly every day and cannot recommend it highly enough. 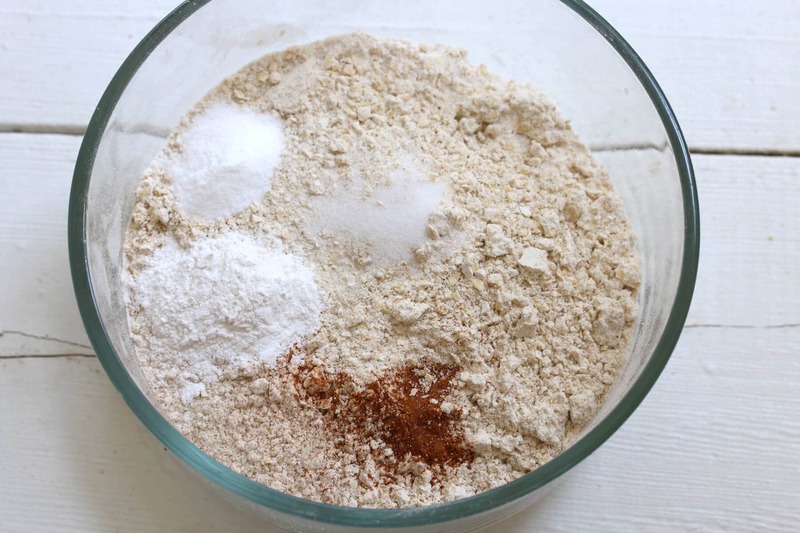 Combine the dry ingredients in a bowl. Set aside. 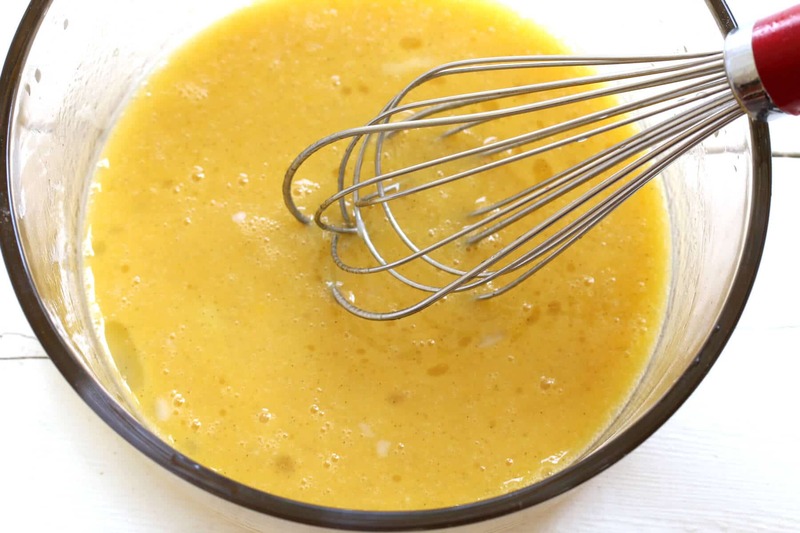 In a large mixing bowl, whisk together the eggs, honey, vanilla paste, butter and coconut oil until combined. Work quickly to prevent the coconut oil from solidifying. 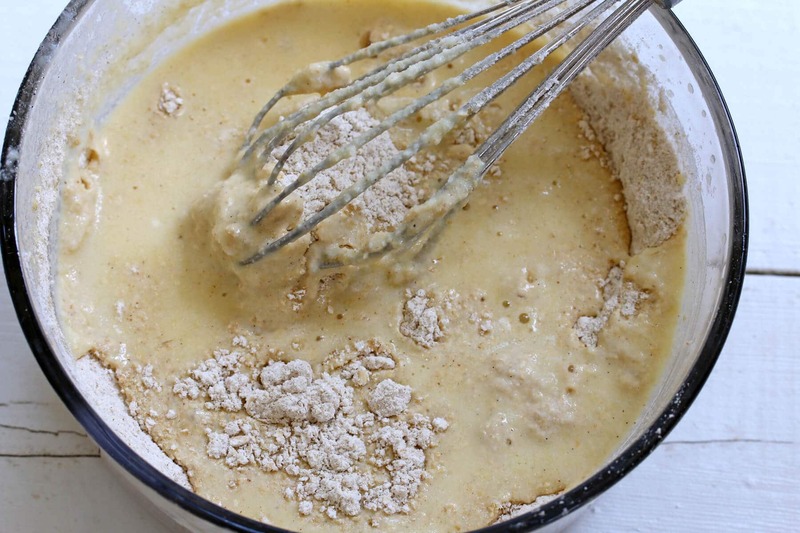 Add the dry mixture to the wet mixture in two batches, whisking just until combined (do not over-mix). Let the batter sit for 10 minutes. In the meantime preheat the waffle maker. Vertical Design with Batter Pour Spout – Instead of sitting flat on the counter it sits upright in vertical position saving a ton of counter space. 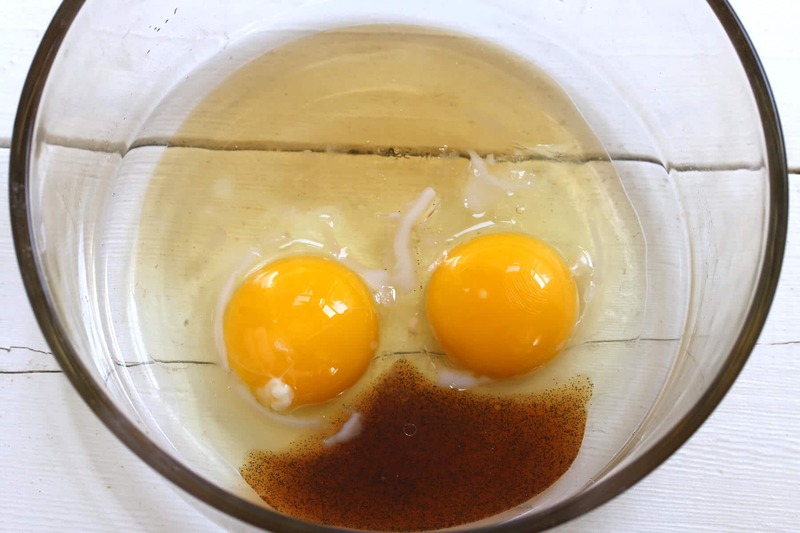 Five-setting Browning Control – No need to guess or monitor for doneness, you simply choose the browning setting of your choice and that’s it – you’ll get your pale, light brown, medium, or dark-colored Belgian or regular waffle. Non-stick Plates – no need to spray. 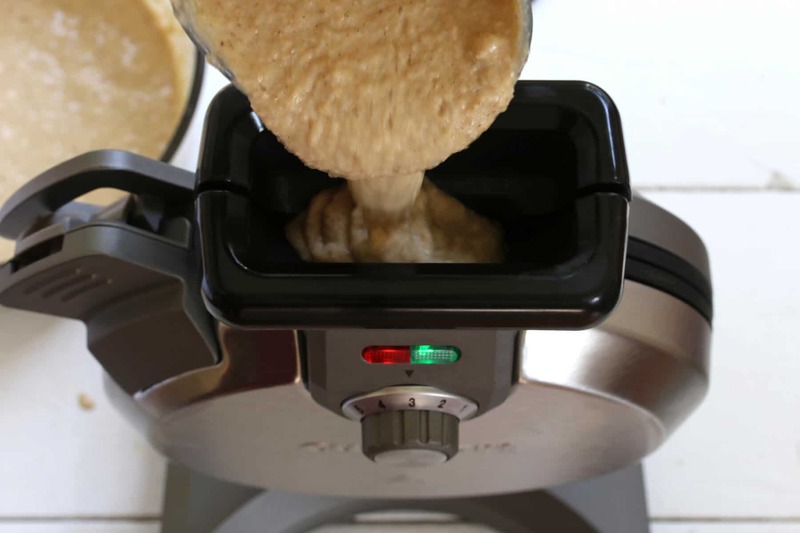 Indicator Lights & Audible Alert – You’ll know when its preheated so you can add the batter and it will let you know when your waffle is done. Sleek Design and Stainless Steel – It’s pretty. 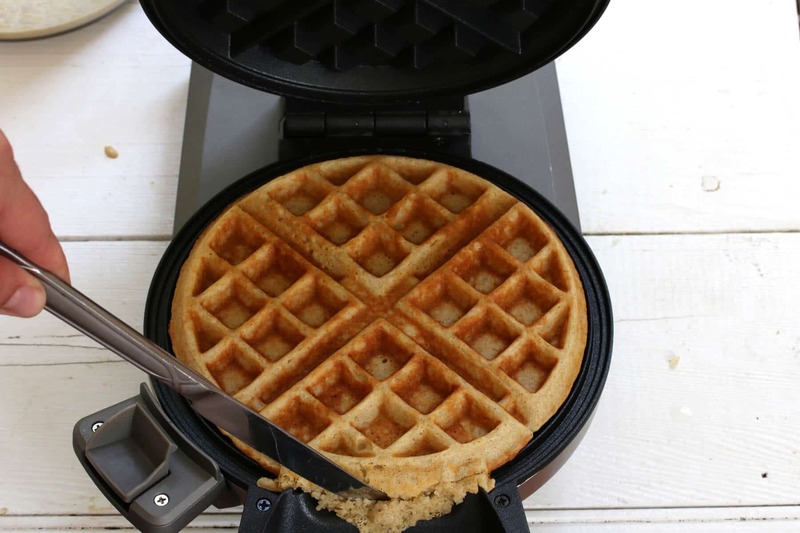 You simply pour in the batter up to the fill line (it also comes with a measuring cup) and it automatically distributes the batter from top to bottom, left to right for a perfect waffle. It has 5 browning settings. I used the recommended setting of “3” for perfect, lightly browned waffles. The indicator light and an audible alert will notify you when the waffle’s done. Then you simply unlatch and lower the waffle maker. If you happened to over-fill the pouring spout a bit, no problem – simply cut off the excess. It worked like a charm – perfect Oat and Buckwheat Waffles! 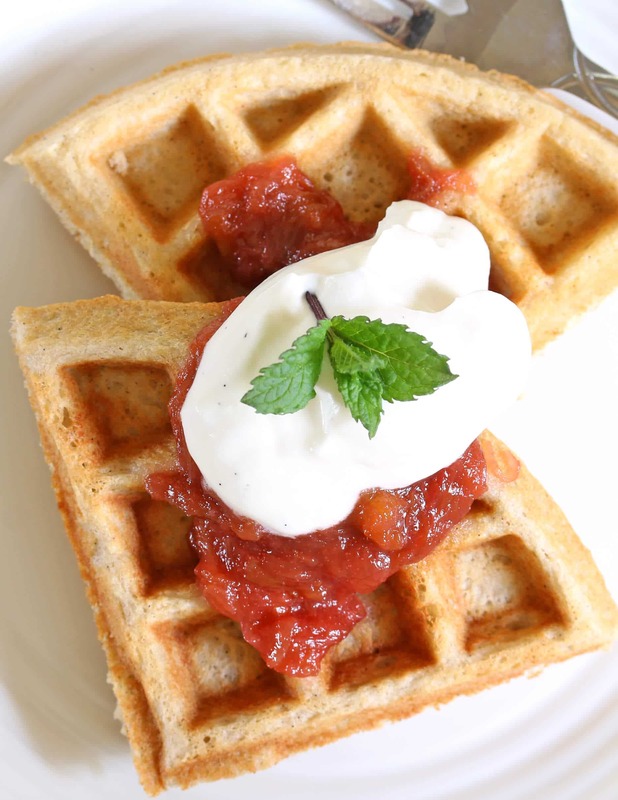 Accompanying our Oat & Buckwheat Waffles is a fresh Rhubarb Compote. I harvested our first batch of rhubarb from our garden to make this compote. 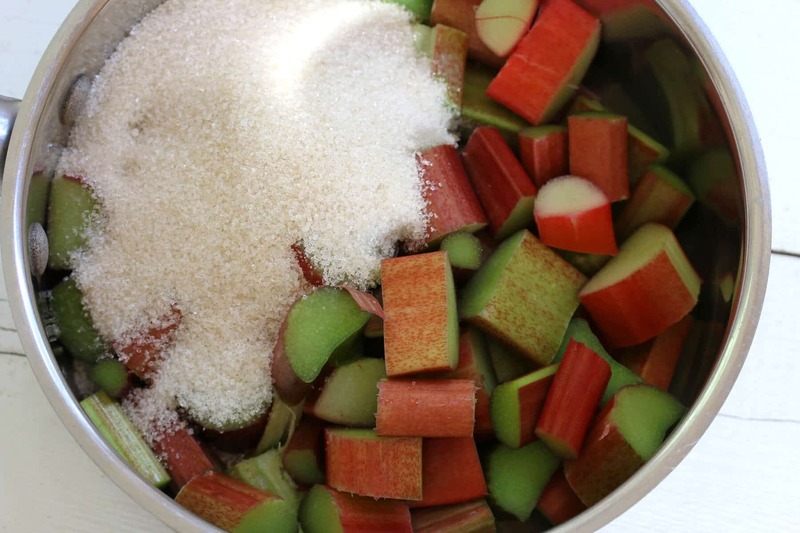 If you can’t find rhubarb or it’s not in season when you find this recipe, use any fruit of your choice and just following the directions as written. Some great alternatives are strawberries, apricots, plums and apples. It’s super simple, you just add the diced fruit to a medium saucepan with the cane sugar and a tablespoon or so of water (if you’re using a fruit with lower liquid content omit the water). Bring it to a boil, reduce the heat to medium-low and let it simmer uncovered for about 20 minutes or until the fruit is soft and the mixture has thickened up. Depending on the water content of the particular fruit you may need to simmer it longer. This can be made in advance and refrigerated for several days. It’s thickened up nicely and has the consistency of fruit preserves. Place the chilled whipping cream and sugar in a medium-sized mixing bowl and beat on high until it begins to thicken. Add the vanilla paste and continue to beat until it forms stiff peaks. For optimal texture, serve the waffles immediately. Serve them either whole or cut into segments topped with the rhubarb compote and vanilla cream. Garnish with a sprig of fresh mint (optional but it looks pretty). NOTE: Feel free to omit the rhubarb compote and cream. These are some of our favorite go-to waffles and they’re also perfect served with your favorite syrup! Place the diced fruit in a medium saucepan with the sugar and water. Bring to a boil, reduce the heat to medium-low and simmer uncovered for 20 minutes, stirring occasionally, or until the fruit is soft and the mixture has thickened. 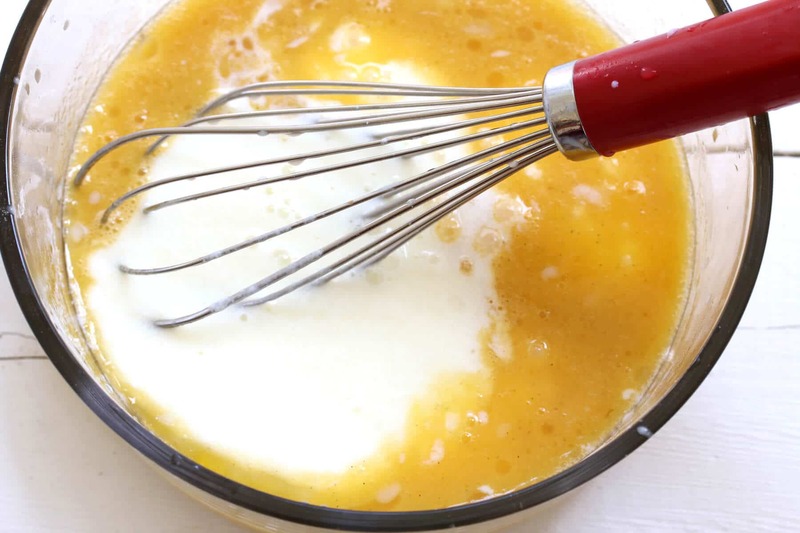 In a large mixing bowl, whisk together the eggs, honey, vanilla paste, butter and coconut oil until combined. 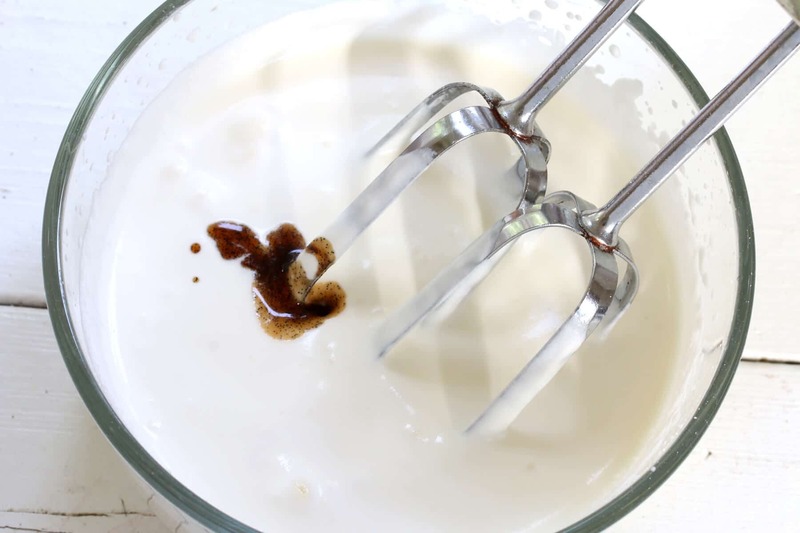 Whisk in the buttermilk. Work quickly to prevent the coconut oil from solidifying. Add the dry mixture to the wet mixture in two batches, whisking just until combined (do not over-mix). Let the batter sit for 10 minutes. In the meantime preheat the waffle maker. 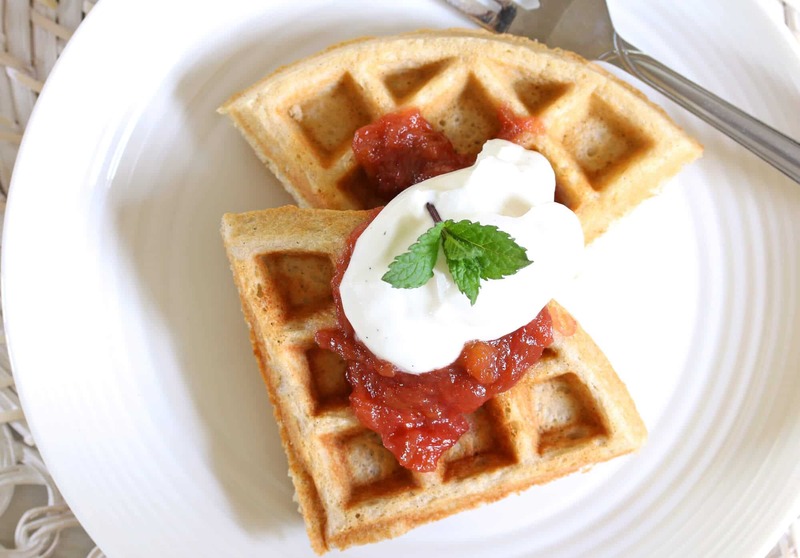 Serve the waffles whole or cut into segments topped with some rhubarb compote and a vanilla cream. If desired, garnish with a sprig of fresh mint. NOTE: Feel free to omit the rhubarb compote and cream. These are some of our favorite go-to waffles and they're also perfect served with your favorite syrup. 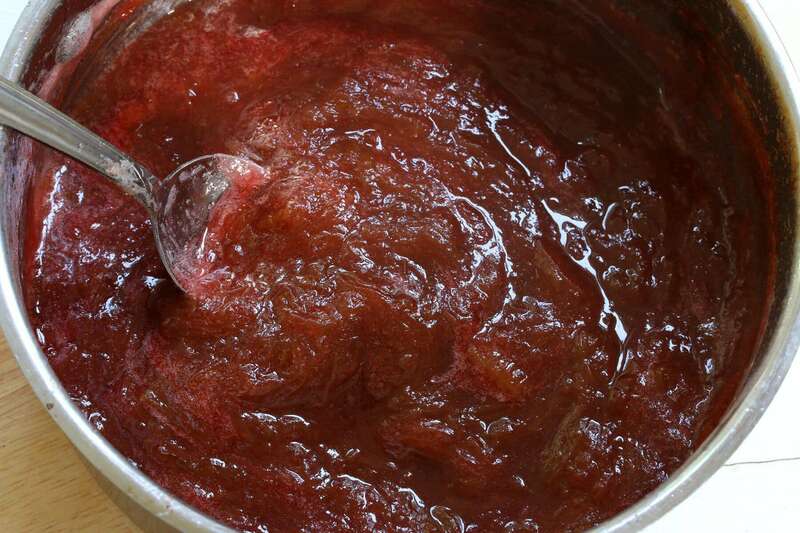 *The Rhubarb Compote can be made several days in advance and stored in the fridge. *The Vanilla Cream can be made up to a day ahead and stored in the fridge covered with plastic wrap. If the liquid separates from the cream beat it again until thick. 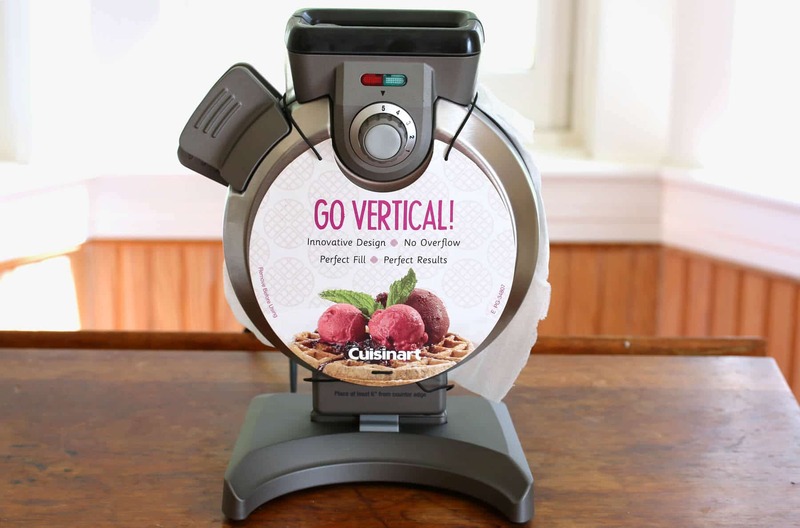 I received the Cusinart Verticle Waffle Maker without any obligation to write about it and without further compensation. All opinions are 100% my own. Your photos are BOMB! Seriously! So crisp and clear. The waffles look amazing too! 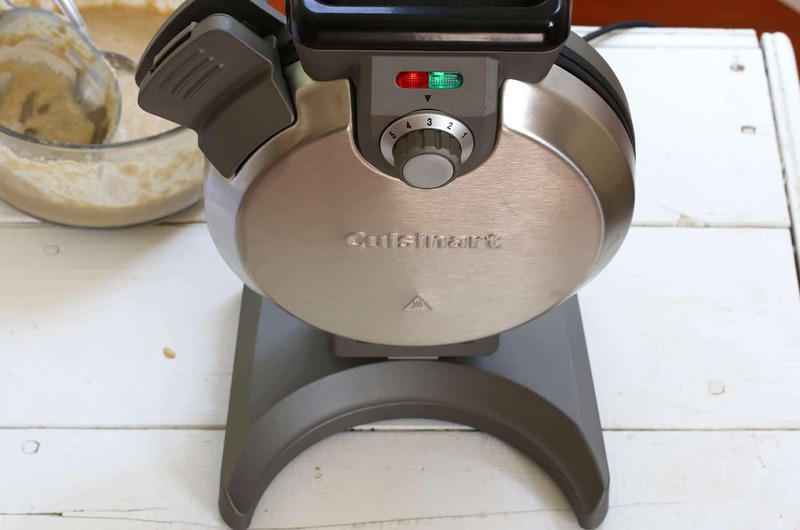 I have one of those square cuisinart waffle makers, so jealous you have the round one! Breakfast, lunch or brunch I say – this meal is perfect! I learned a lot about your ingredients too and that waffle maker, looks just fantastic! 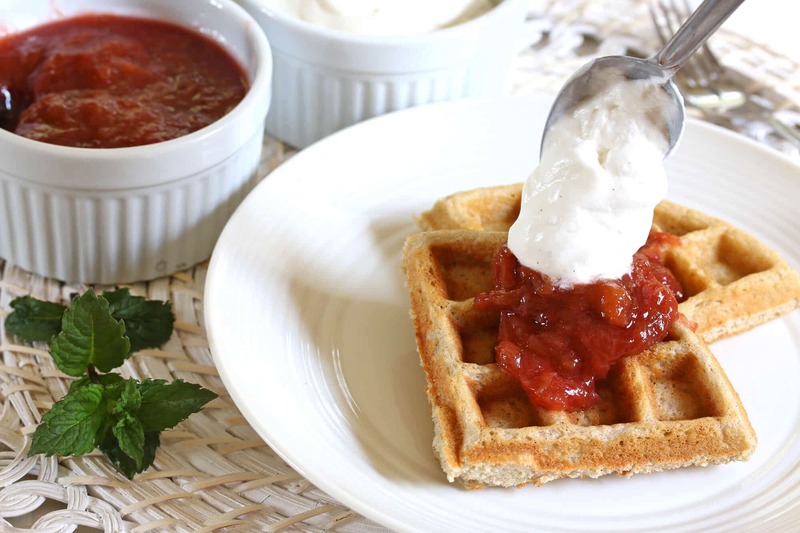 Oh my gosh, these waffles look amazing, and that rhubarb compote! Yum! I did not know buckwheat was a seed. 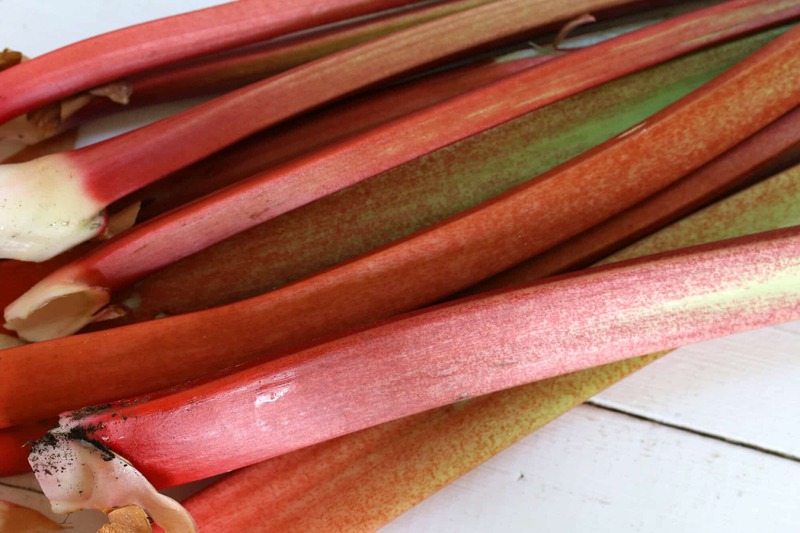 I love learning new food facts and I especially love rhubarb. The creativity of this recipe is so unbelievable!! I’ve never had rhubarb but after seeing it on these beautiful waffles I’m going to have to change that! I never knew all that information about Buckwheat! Thanks for sharing! Vertical waffles look like so much fun too! These look way too good to be healthy!! I can’t wait to try these! 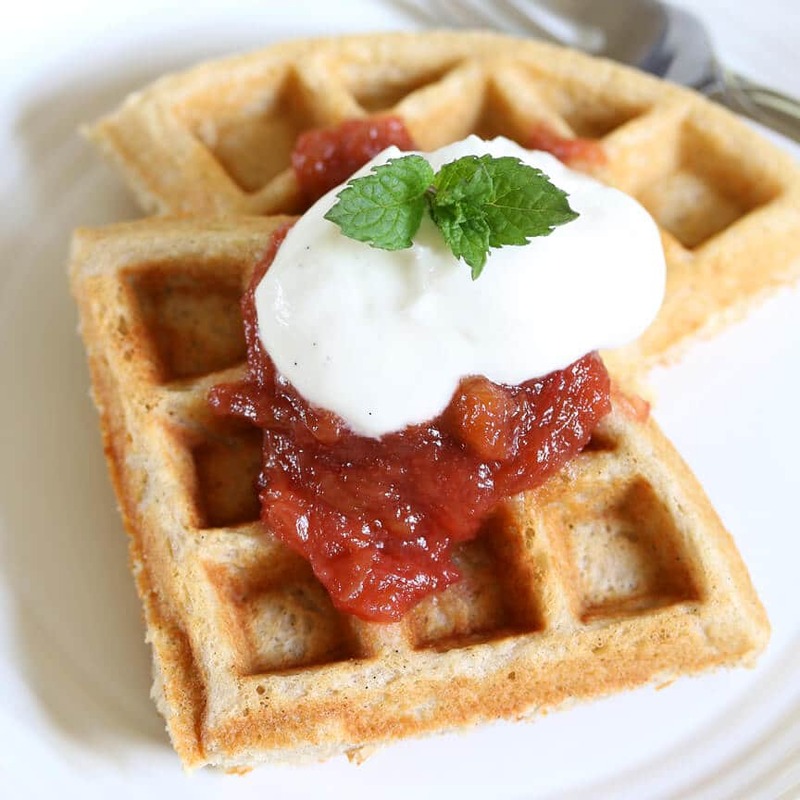 Sign me up for the rhubarb compote and that cool vertical waffler! These look heavenly! What a perfect breakfast! Such a delicious breakfast and I LOVE finding new ways to use rhubarb! These look like the perfect way to start the day. Love that you used buckwheat! I love everything about these waffles! I will definitely enjoy those anytime of the day! Great photos! I can’t believe I don’t have a waffle maker because these are seriously my kind of waffles! Perfection with the rhubarb too. Wow these waffles look delicious and all those fun gadgets you have. 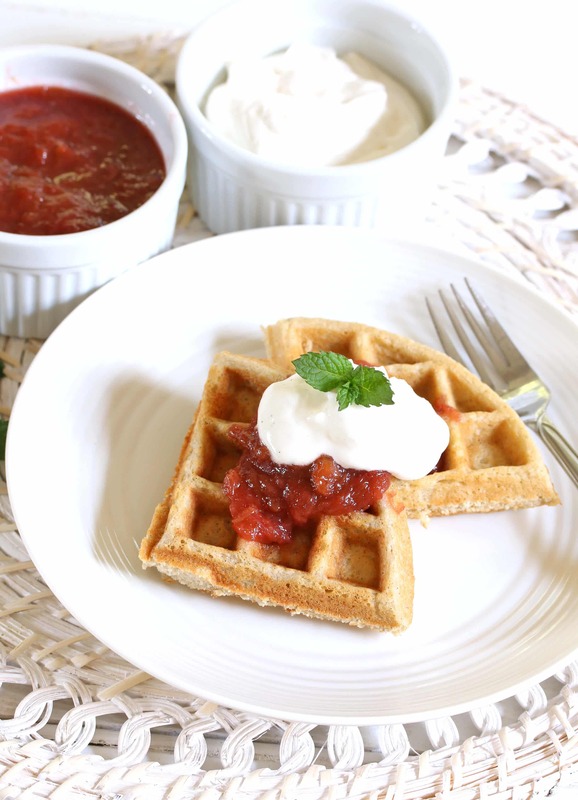 Everything from the waffles to the rhubarb is making me crave these right now. I love everything about this, but I am soooo envious of your own rhubarb!! I just had some sent to me from Frieda’s Specialty Produce yesterday and guess what I made last night? Yep, compote! I use it in my yogurt for breakfast and it’s like eating dessert! Now that I have my own KoMo mill, I can totally make these waffles! They look awesome and how nutritious they are, too! Great post as always, Kimberly! These sound delicious! 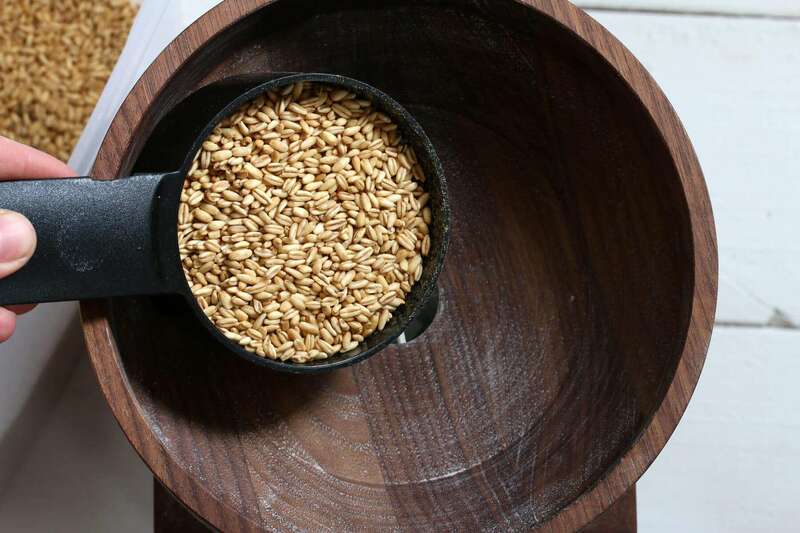 love that these are made with oat and buckwheat flour – I seriously need to start making my own flours! I am swooning over that rhubarb compote! Amazing, I love homemade waffles. This looks like the perfect weekend breakfast! I bought a bag of buckwheat flour and one of whole buckwheat last week, can’t wait to try them. 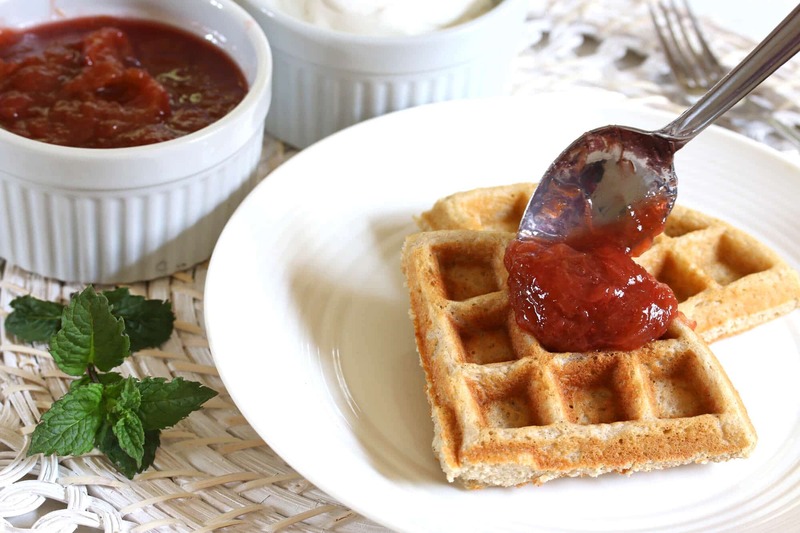 This waffle recipe sounds great, and I especially love the rhubarb compote. ❤️❤️❤️I just made this recipe! It is WONDERFUL! I didn’t have buttermilk so I used plain kefir instead. I will definitely make these again and again! Thank you! That’s fantastic, Cindy, I’m so glad you enjoyed it, thank you! And kefir is a perfect substitute. I make my own daily and use it for anything that calls for buttermilk. Wonderful, Tanya, I’m so happy to hear that, thank you!